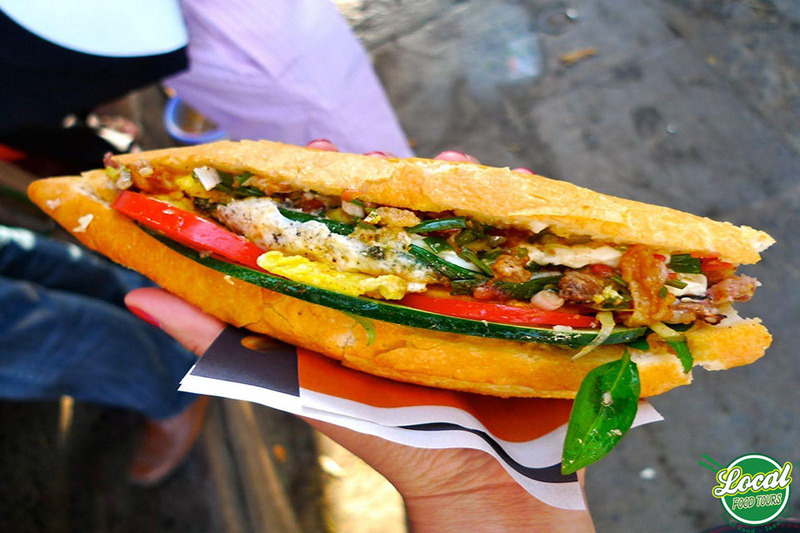 Banh mi Hoi An is considered “the best banh mi in the world”, it is the street food that most tourists want to enjoy when traveling on Vietnam food tour. Banh mi just shows the rustic and simple character, just shows the subtle flavor of Vietnamese cuisine. Come to Hoi An, you can not miss the eight famous banh mi here. If you try a search on Google the keyword “best banh mi in Vietnam”, the name you caught first is “Banh mi Phuong”. It is not exaggerated to said that Vietnam’s famous Phuong banh mi shop is famous both inside and outside the country. On social networks or travel websites such as Tripadvisor or Foursquare, many people, including foreigners, are also satisfied with this little eatery. Although the area is not large but the small restaurant is located at No. 2B, Phan Chau Trinh Street, Hoi An is never empty. The shop usually serves from 6am – 10pm all days of the week. The menu here is also varied with over 20 different types of savory ingredients for diner such as roasted meat, sausages, pate, chicken with butter and salad, cheese and onion, beef rolls with cheese, ham, etc. However, the key of those tiny and delicious banh mi Hoi An is the sauce. Banh mi Phuong is covered with a homemade sauce made with an extremely special secret formula. In addition, the savory ingredients also contribute importantly to make the delicious, tough, crispy and fragrant smell of banh mi. Bread at Phuong Restaurant is usually produced by family members. Banh Mi Phuong – a good place to eat when traveling to Hoi An on food walking tour, not only touches the heart of the people of Vietnam but foreign tourists also love the rustic dishes of Vietnam. Besides, with the price from 10.000 – 30.000đ you can enjoy a delicious banh mi, hot thanks to the heat on the charcoal stove. Banh mi Phuong will awaken all senses in you, creating a burst of taste. Biting a piece of bread, we can feel the essence of Vietnamese cuisine in general and of Hoi An in particular. This is also a popular bakery because of the unique pate, unlike other restaurants. There is no any fatty taste which makes customers bored. Many young people review is holding a loaf of bread that is not watery, the inside ingredients have a strange taste that is delicious, no matter how much bread you eat, trying a lòa of banh mi Bich will give you an amazing feeling. Banh mi Bich shop is now moved to Hoi An cinema, 57 Phan Chu Trinh, the number of visitors on Vietnam food tours to the restaurant is quite stable, so you do not have to worry about long queues waiting, the price here very reasonable so you do not have to hesitate to buy, especially the hostess is very friendly! Well, another note is that the shop does not open on the full moon day, so except the full moon day, you can come here to be always served!